With his shock of black hair and calmly handsome features, 20-year-old Abbas Alizada is the spitting image of a certain famous martial artist and film star – and armed with some nunchuks and a vest, he transforms himself into Bruce Hazara, Afghanistan’s premier Bruce Lee impersonator. The photos and videos he posts on his Facebook page, executing high kicks and looking intensely down the lens, have now earned him viral fame. He’s earned over 50,000 followers on Twitter, al-Jazeera have filmed him in action, and Reuters have gone to Kabul to interview him. “I want to be a champion in my country and a Hollywood star,” he told the latter. “The only news that comes from Afghanistan is about war … I am happy that my story is a positive one.” He stages pictures amid the ruins of the Darul Aman Palace, and he takes the name Hazara from his tribe. “The destruction here makes me sad, but it also inspires me,” he says. Inspired by his “childhood hero” Lee, Alizada has learned the art of nunchuku as well as wushu, coming top of his category in a recent martial arts competition. Strangely enough he’s not the first Hazara from Afghanistan to be seduced by Lee’s righteous fighting style. 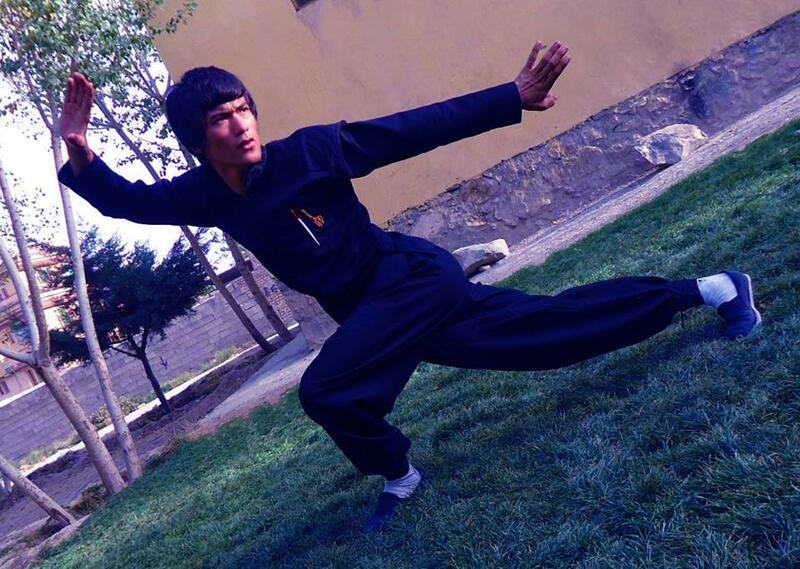 Hussain Sadiqi, another Hazara tribe member, began martial arts as a child after seeing a photo of Bruce Lee. He fled the Taliban in 1999 and took up a nomadic lifestyle, eventually settling in Australia, dreaming of a Hollywood career as a martial arts star. A short documentary was made about him in 2011 by Alex Barnes, earning screenings at various film festivals.